15 Now Portland has been very busy this spring. Although he was not able to unseat 16-year incumbent Dan Saltzman, independent socialist candidate Nicholas Caleb ran for Portland city council on a platform based largely around the fight for a $15 minimum wage and got a great echo for his campaign. 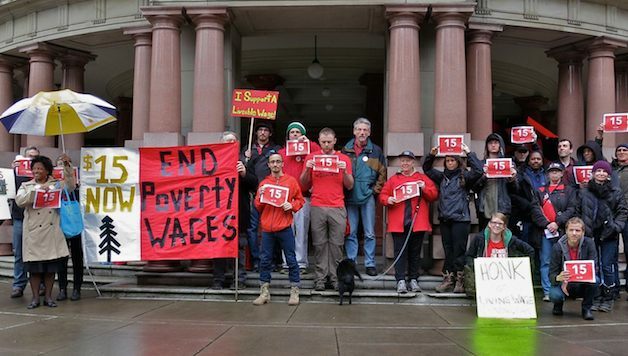 Caleb’s campaign, along with the establishment of 15 Now and Socialist Alternative chapters in town, have brought the living wage issue to the forefront in Portland. 15 Now PDX has been holding weekly “Living Wage Wednesday” rallies outside of city hall calling on the council to take action to end poverty wages, and to embrace a $15 minimum wage. On May 15 roughly 40 people marched into the downtown McDonald’s and read a letter aloud to the workers, customers, and bosses in solidarity with the global strike of fast food workers. Largely influenced by the 15 Now movement, and the Caleb for Council campaign, councilman Saltzman even announced that he is in favor of raising the minimum wage. However, thanks to the restaurant lobby, since 2001 Oregon state law has preempted cities from raising the minimum wage locally. This means that any effort for $15 will require a coordinated statewide effort, or a repeal of the state’s preemption. 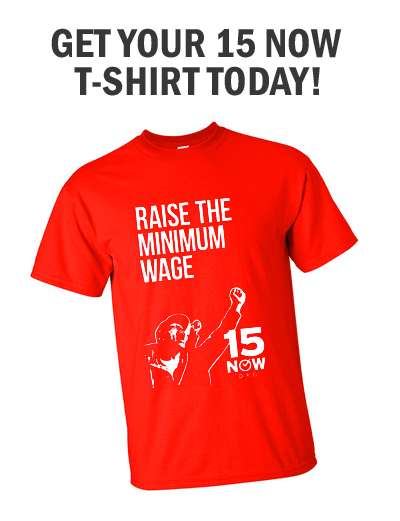 On June 11th, members of 15 Now PDX will give a brief testimony in front of the city council highlighting the need to raise the minimum wage, and to present them with 1,000 signatures in support of a $15 minimum wage. We know that real change doesn’t come from the top, it has to be demanded from below.